Block 11, with 292 apartments will complete the delivery of over 2,200 apartments across the entire 5.8-hectare Central Park precinct. 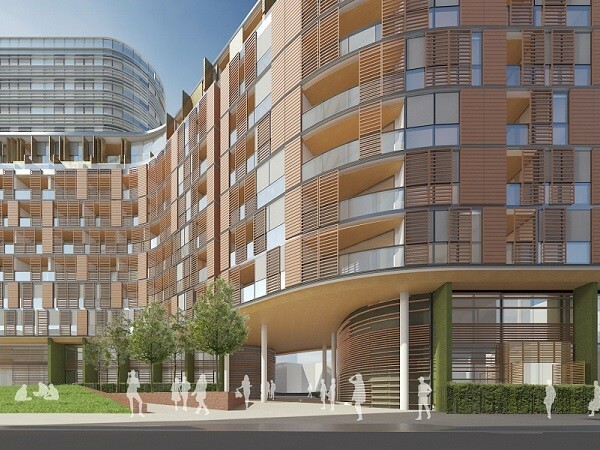 The strikingly-designed building, 8-13 storeys in height, curves in the centre to make space for two new public gardens and will include a mix of one bedroom suites, two and three bedroom apartments and a range of two bedroom dual-key apartments. The building will also feature a small amount of mixed-use ground floor retail space and a childcare centre to accommodate 90 children. Central Park Project Director Mick Caddey observes that Central Park, at its completion scheduled for 2018, will have involved a complex nine-year program of design, planning and construction. He added that the careful collaboration between Frasers Property and fjmt will see the delivery of an exceptionally-designed residential building, reflecting the high benchmarks set in design and master planning in every other aspect of the project. Design Director of fjmt, Richard Francis-Jones said the practice’s design for this important final residential stage of Central Park introduces a curvilinear and fluid architecture. He explains that the most critical element of the design is the unique facade, which is designed to integrate the outdoor spaces, such as the loggias and balconies, while providing shading and privacy where required. According to Francis-Jones, the project’s design concept allows the curved form of the building to embrace two distinctive landscaped areas at ground level, which not only anchor the building in its surroundings but also provide a soft lush setting for the apartments. The block 11 building is divided into three individual parts, each with its own unique foyer: The western foyer is located directly opposite Chippendale Green, the central foyer is directly opposite Park Lane, and the eastern foyer opens onto the northern landscaped area and retail terrace. Some of fjmt’s recent high profile projects include the harbour-front apartments at Barangaroo South, the Auckland Art Gallery, which won the 2013 World Building of the Year award, the University of Sydney Law School, the Surry Hills Library and Community Centre, and The Mint historic restoration.